Do you have an old beloved recipe from your grandmother that calls for salad oil? You may even see signs of the once-used oil on the card or paper the recipe was written on, but exactly what kind of oil was this? We all know that corn oil comes from corn, grapeseed oil comes from well, grapes, and sunflower oil comes from sunflowers, but where in the world does salad oil come from? Salad oil basically refers to any light-tasting oils like vegetable, corn, canola or grapessed. When an older recipe calls for salad oil, be sure to stay away from oils that add a lot of flavor to a dish. Be sure to choose an oil with a delicate flavor. My preference is always grapeseed oil. I just love everything about this salad from the dressing, from the texture of the berries, to the kiwi and almonds; this is a winner and very different from your everyday salad. I also think that kiwi is one of the prettiest fruits God ever made. Quickly toast your slivered almonds on the stove top in a dry pan over medium high heat; stirring constantly. Do not walk away from the pan. This only takes about five minutes and will intensifies the flavor of the almonds immensely. Set the nuts aside to cool. 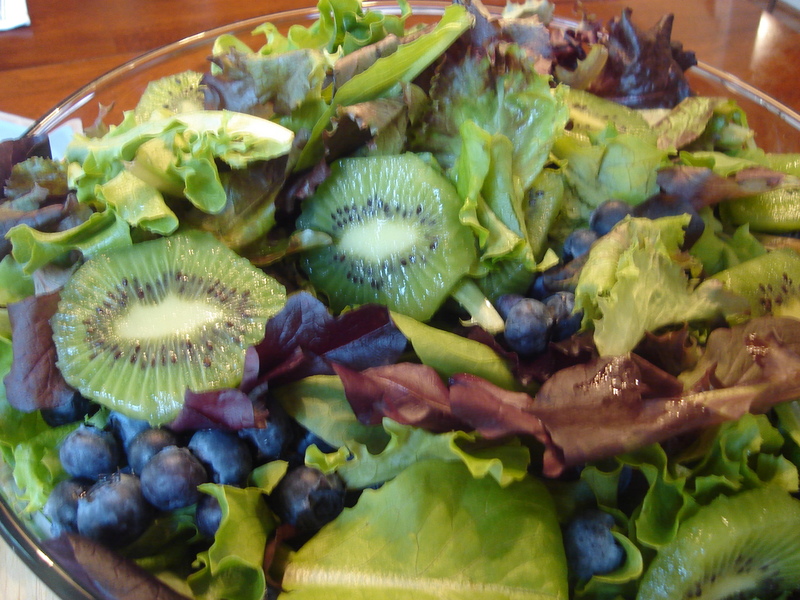 Place your lettuce in your favorite salad bowl, add sliced kiwis and blueberries. Refrigerate until ready to serve. In a bowl whisk together vinegar, agave nectar, dry mustard, salt, poppy seeds and onion juice. Slowly add one cup of grapeseed oil, whisking vigorously as you add. Never dress your salad too early, unless the recipes directs you to. when ready to serve, add your toasted nuts and Poppy Seed Dressing and toss to enjoy! 2 Comments on "Blueberry and Kiwi Salad with Poppy Seed Dressing: Not your everyday salad"
Hi Rebecca, this salad can serve 4 as a meal or 6 to 8 as a side.